Zion Balogun, the third son of Nigerian popstar, Wizkid in a cute shot with his mum, American Talent Manager, Jada Pollock. Jada Pallock heap praises on him despite being called out on social media by his other babymamas for lack of care and child support. 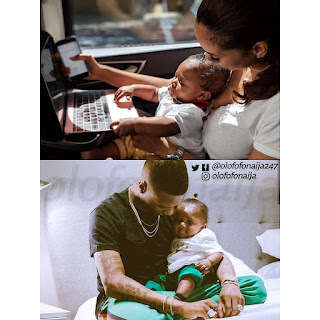 Weeks ago during a radio interview wizkid said that his parents discovered that he was expecting a third child from a third baby mama on social media. The singer made the disclosure during an interview on Beat FM in Lagos. After three boys, the singer said he wants to father another child, but this time, a girl. “I’ve got three kids, three lovely boys that I love so much. I want a girl,” he said.